Deer Creek Fiddlers is a hornpipe that draws upon several fiddle traditions. I think of a hornpipe as having a bouncy swing and I tend to have a greater amount of humor in my hornpipes than in my reels. This tune was written for David Greene, fiddle player and organizer for many years of the Deer Creek Fiddler's Convention (Carroll County, Maryland). Recorded by Amy Leonard, violin; E. Shawn Qaissaunee, guitar; and Peter McCarthy, bass. Note: The recording is a tune demo, not a full-length performance. As I described on my page for New Market, "This tune represents a vision that I have had since the early 1990's of old-time fiddle music being one of the roots of early jazz. In this vision I see jazz musicians going back to these pre-New Orleans roots and discovering the music". 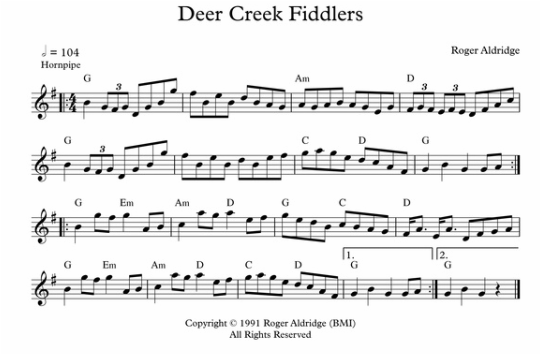 While Deer Creek Fiddlers was written to be a traditional-style fiddle tune, jazz players can use what is notated as a point of departure. That is, it can be played in a modern way while retaining its roots music spirit.